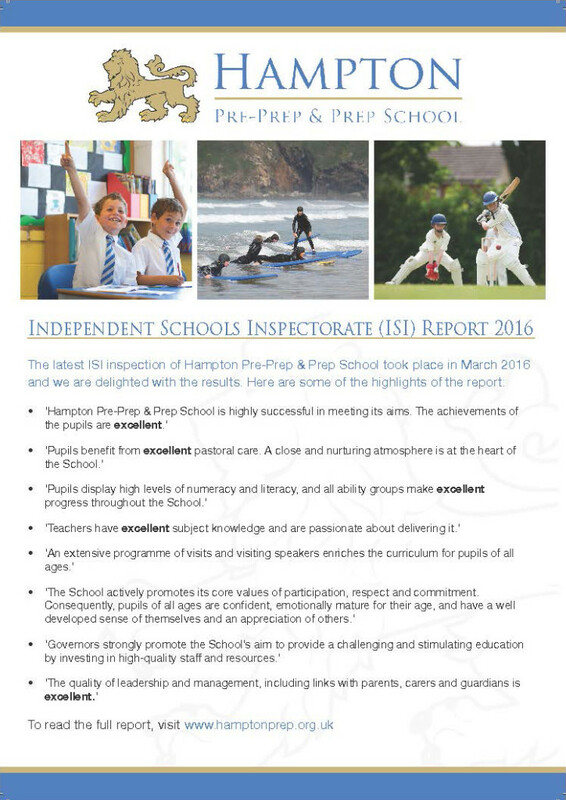 Hampton Pre-Prep & Prep School is regularly inspected and assessed by the Independent Schools Inspectorate (ISI), the body approved by the government for the purpose of inspecting independent schools in the UK. This page details the outcomes of the two most recent ISI inspections conducted at the Pre-Prep & Prep: the Regulatory Compliance Inspection in March 2019; and the Integrated Inspection (Educational Quality and Compliance) in March 2016. Regulatory Compliance Inspection (RCI) reports issued by ISI are rather generic in nature. The 2019 inspection visit reported only on the School’s compliance with standards. The standards represent minimum requirements and judgements are given as met or not met. Hampton Pre-Prep & Prep School has met all of the inspection criteria and as such is judged to be fully compliant. The School meets the standards in the schedule to the Education (Independent School Standards) Regulations 2014 and no further action was required as a result of the inspection. Hampton Pre-Prep and Prep School is highly successful in meeting its aims. The achievements of the pupils are excellent. Pupils display high levels of numeracy and literacy, and all ability groups make excellent progress throughout the school. Pupils benefit from excellent pastoral care. A close and nurturing atmosphere is at the heart of the school. Strong support systems are in place and pupils feel their voice is heard and valued. An extensive programme of visits and visiting speakers enriches the curriculum for pupils of all ages, and residential trips in Years 3 to 6 contribute greatly to the pupils’ educational experience and personal development. Throughout the school, teaching is a strong contributory factor to the pupils’ excellent achievement. Teachers have excellent subject knowledge and are passionate about delivering it. Teachers create an excellent rapport with their pupils, which instils in them a respect for one another, a thirst for learning and the confidence to contribute. The school actively promotes its core values of participation, respect and commitment. Consequently, pupils of all ages are confident, emotionally mature for their age, and have a well-developed sense of themselves and an appreciation of others. They have an excellent level of personal development by the time they leave the school. Governors strongly promote the school’s aim to provide a challenging and stimulating education by investing in high-quality staff and resources. The substantial investment in new, state-of-the-art accommodation for the preparatory pupils reflects the governors’ careful planning. The quality of leadership and management, including links with parents, carers and guardians is excellent. This reflects the commitment of the leadership to encourage a supportive and stimulating environment where everyone’s opinion is respected.